When I fantasise about running my own shop, stocked with the greatest menswear money can buy, it normally involves having the finest tailor and the finest shoemaker on site, beavering away just for me. 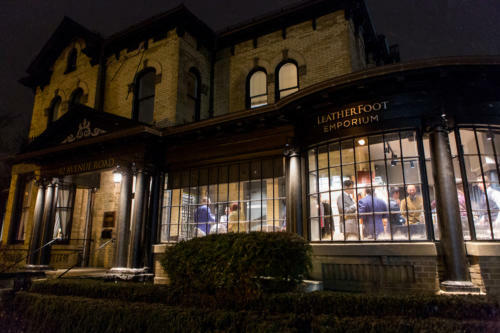 I discovered last week that Ideyi of the shop LeatherFoot in Toronto, Canada, has done just that. Not only has the shop moved to a beautiful, big old townhouse, but he has persuaded local tailor Francesco Pecoraro, and bespoke shoemaker Koji Endo, to move their workshops in there with him – in Koji’s case all the way from Japan. I’ll write more on both craftsmen later, but for the moment I’d like to say a big thank you to Ideyi and local writer Pedro Mendes (of The Hogtown Rake) for inviting me over to Canada, and their wonderful hospitality while I was there. It’s always lovely meeting readers at these events around the world (the power of internet!) but the guys in Toronto were particularly enthusiastic. We had some cocktails and food, standing in front of the huge bay window the shop has, looking out on the main road. Then Pedro interviewed me on camera for the audience, before opening up the discussion to their questions. There were some great points here – particularly around value for money. There is a natural tendency among menswear enthusiasts to shoot for the very best. 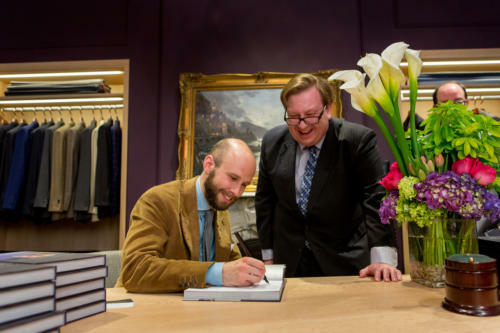 Particularly when other enthusiasts like me write books like ‘The Finest Menswear in the World‘. But when guys are starting out, they will get much better value for money by just investing a little bit here and there. 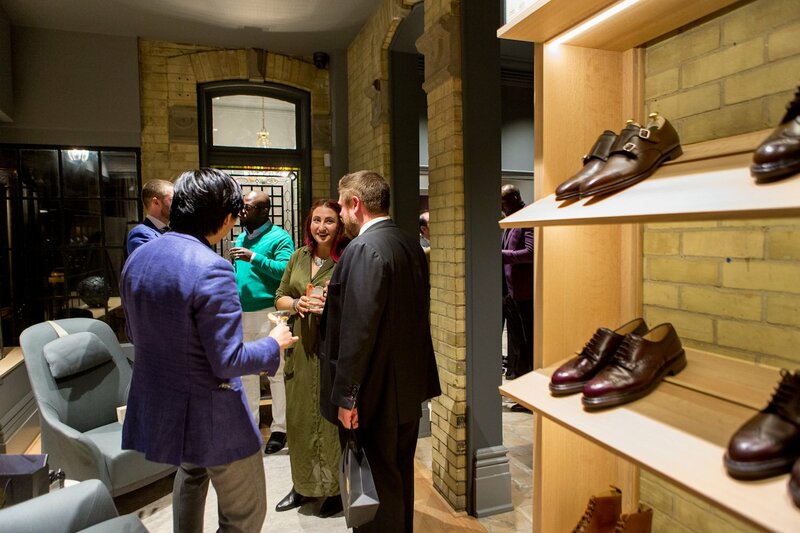 By buying Crockett & Jones shoes, and not shooting for Saint Crispin’s just yet. By saving up for a good Frank Clegg bag from the shop, or a couple of nice, conservative Cappelli ties. Because all these items necessarily experience diminishing returns. You get a lot more value in trading up to Crocketts from those crappy, cemented high-street shoes you were wearing before. You get good leather, Goodyear welting and proper structure (toe puff etc). The next level gives a nicer waist and maybe hand sewing – not quite the same. Thank you to everyone, for your interest, your enthusiasm and your questions. I’ll do a separate post some time on my old corduroy Anderson & Sheppard suit, worn here. But I would like to give a shout out to my beautiful raccoon-and-beaver hat, which I am wearing with Pedro in the shot below. It is from the wonderful Eggert in Iceland, stocked at Anderson & Sheppard on Clifford Street. And it is very rarely cold enough in the UK to justify it. Only recent trips to New York and Toronto have pushed it into service this year – so thank you, East Coast weather. 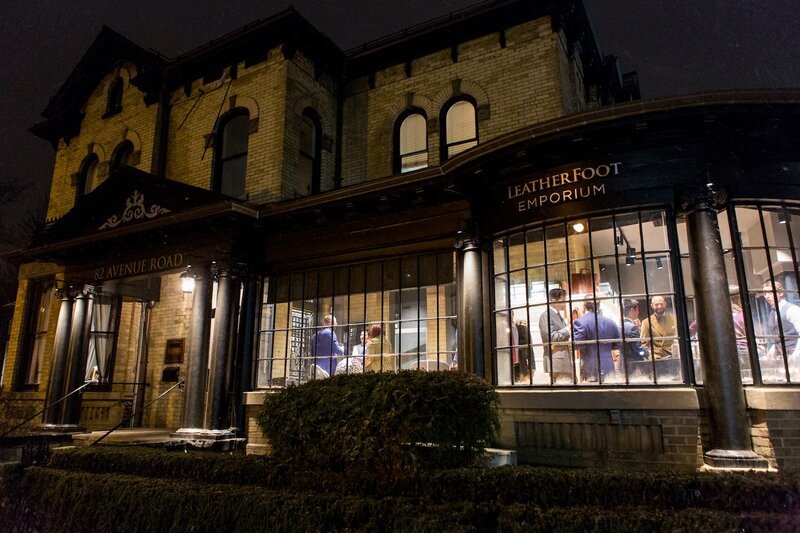 You can follow the discussion on Book signing at the Opening of LeatherFoot, Toronto by entering your email address in the box below. You will then receive an email every time a new comment is added. These will also contain a link to a page where you can stop the alerts, and remove all of your related data from the site. Just noticed you are wearing your cashmere overcoat in the last picture. Do you find it warm enough in such conditions? I ask because I am looking at having a coat made for next winter and always dubious if the cashmere is as warm as say a thicker traditional English wool. 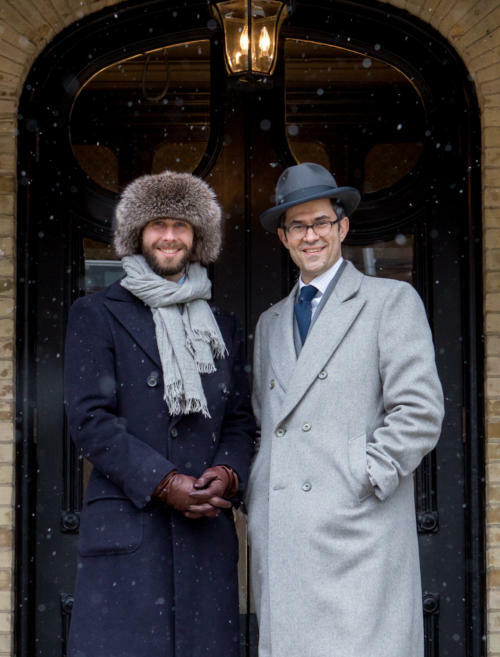 I tried a cashmere peacoat last year and whilst I liked the lighter weight of it for comfort but didn’t have the warmth. It wasn’t really warm enough, no – my Edward Sexton coat (look up post on that) would have been much better. Excellent and very happy looking posting – lots of smiling faces in this one. Question about purchasing a leather bag as you mentioned. How does a Frank Clegg messenger bag compare to say Bill Amberg? Seen one of the latter in a sale so don’t know whether to grab or continue saving. Particularly wondered about leather quality, durability of stitching etc. Many thanks, keep up the great stuff you put on here. You must have inspired Wes Anderson when he was conceiving Fantastic Mr. Fox. The resemblance is uncanny! Another excellent post – very interesting. As a man of a ‘certain age’ most of my clothes are bespoke and I embrace the idea of permanent style rather than the brevity of fleeting men’s fashions. 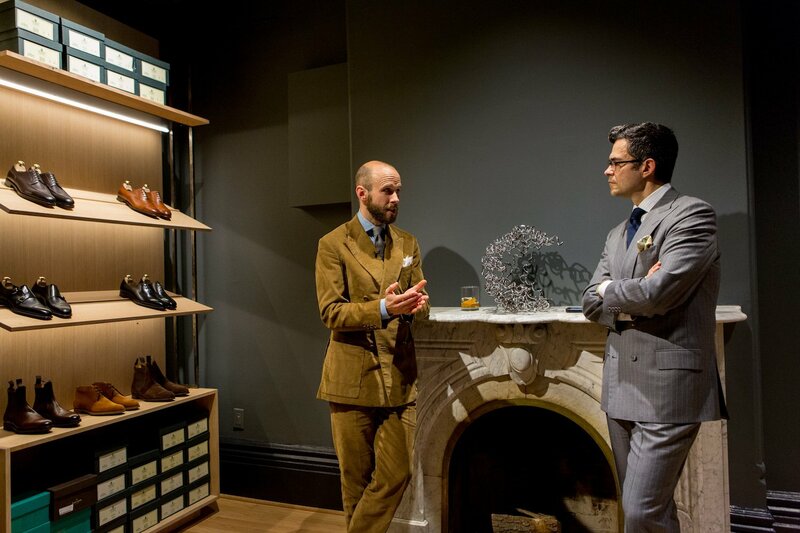 Looking at the shelves in one of your photos above I notice a brown pair of double monks sitting there. I have in recent months come very close to buying a pair myself ( Lobb William 11 model ) but have backed away thinking that these will eventually go out of style and/or they are more suitable for a younger man. Any thoughts ? 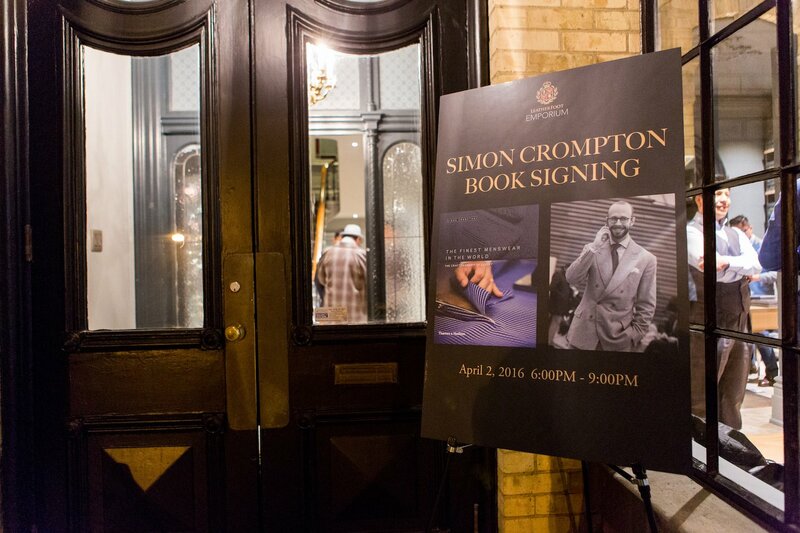 I’m glad you enjoyed your time in Toronto Simon. And your taste of a Canadian spring (expect anything). We started last week here in Edmonton with wet snow on Monday and plus 23 celsius and sunshine by Friday). Outerwear can be a real challenge in spring. LeatherFoot looks great. I’ll have to look it up next time I’m in Toronto. Do. It’s one of the loveliest menswear boutiques I’ve ever been in. I’ve enjoyed reading this briefing post from your trip to Toronto. 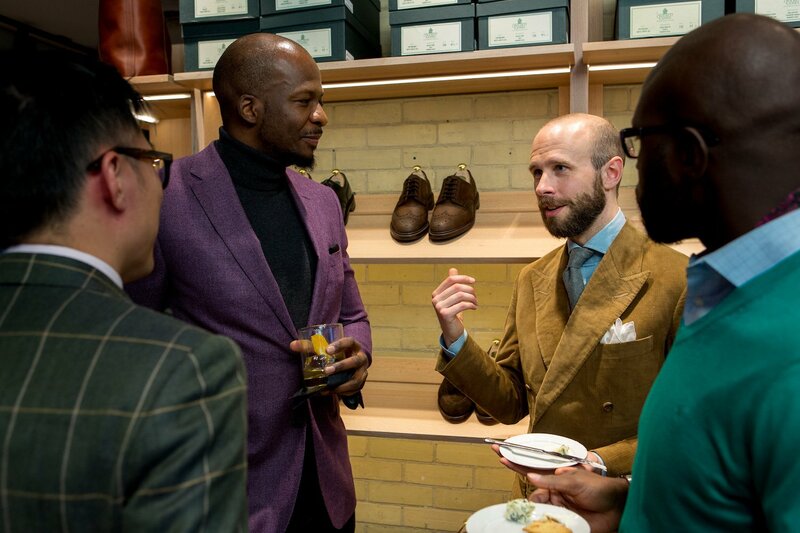 Most importantly is the implication of your advice related to how to build up a good shoe wardrobe. I think it equally applys to other items. Being rather a jacket wearer, over the past few months I’ve been thinking about acquiring a new jacket. Anyhow remembering the same kind of advice read in one of your past posts, I’ve come to thinking that the best move I could make might be to find out a nice and hard wearing middle range one instead of a high end one that may not be hardwearing enough (wool blend and the like). Yes, as to shoes I think it’s indeed wiser to start with Crockett & Jones than making a big leap to St Crispin or G&G. To me it’s a good reminder! There are precious few offices of cloth companies in London any more, but Scabal and Holland & Sherry on the Row both have some longer lengths (if not bolts) on hand. Holland and Holland on Bruton Street is an amazing place, probably worth mentioning here too. 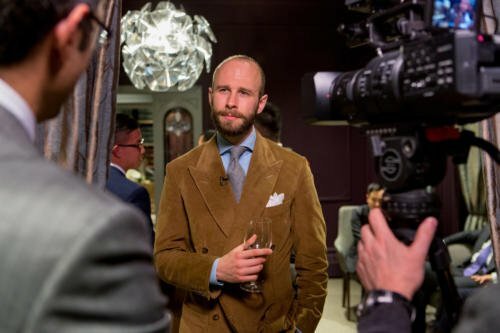 Why flannel odd jackets are generally frowned upon because flannel is a suiting fabric but flannel trousers are perfectly acceptable as separate? 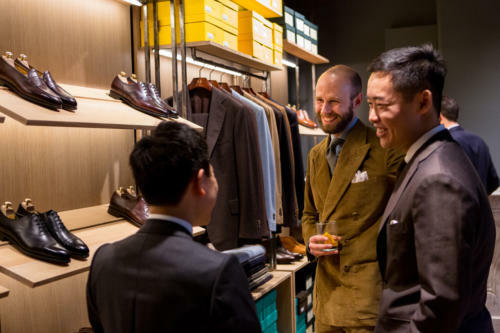 Yes, it’s much easier to wear suit-type fabrics as trousers than as jackets. Fresco is similar. I’m about to start work at an investment bank. Obviously for fridays without meetings one can easily wear cashmere blazer, various trousers etc… its about variation and numbers of the formal stuff that is really stumping me? There’s not much room for variation really. I’d start with three suits, as you say, single breasted, and a couple of pairs of black oxfords – maybe a brogue and a plain cap toe. Bear in mind you will get a better sense of what is appropriate when you have started. Is there perhaps a future S. Crompton Clothier boutique in the making? Haha, now that I can relate too. But, do the shop, and hire someone to do the people thing. Should be interesting to see all these craftsmen under one roof. It has yet to happen! Can you tell me the name of books on the table on pic #7. I can not see it.